Davies Craig Power Steering Oil Cooler UNIVERSAL - Dezod Motorsports Inc - Home of the automotive performance enthusiast since 2002.
steering system, especially in vehicles with large tires such as performance vehicles, off-road vehicles and vehicles used for towing or carrying heavy loads. 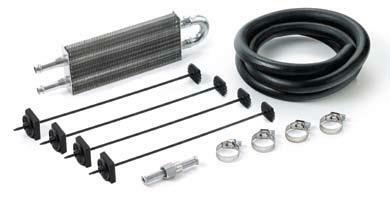 Installation of a power steering oil cooler will prolong the life of the system’s pump, hoses, and seals. A reduction of just 11°C (20°F) can double the life of power steering, the fluid and all internal parts.